This is the limited edition of the first edition of A Thief of Time, which is Tony Hillerman's eighth Navajo Mystery novel. This edition was published in 1988 by Harper and Row in New York City, New York. 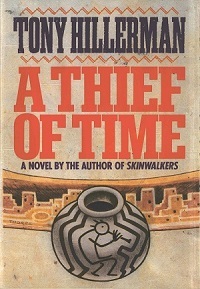 The cover illustration is by Peter Thorpe, who designed a majority of the American covers, and depicts a ceramic vessel featuring a Kokopelli in front of Ancient Pueblo ruins. Format: Hardback, 24 x 16.2 cm. Binding: Yellowish white cloth boards and the author, title, and publisher is printed in red vertically on the spine.